1. Mix together the biscuit crumbs and melted butter then press into the base up the sides of a 23cm tart tin. Pop in the fridge for a few minutes to set. 2. Meanwhile, break the chocolate into squares and melt in a heatproof bowl set over a pan of simmering water. Stir in the vanilla extract then leave to cool. 3. Slice the bananas and arrange on the biscuit base. 4. Whip 200ml of the cream until stiff then gently stir in the cooled chocolate and the chopped fudge. Spoon over the bananas then cover and chill for 2 hours or overnight, until set. 5. Stir the lemon juice into the remaining cream to thicken. Cut the pie into slices and serve topped with a spoonful of the cream. 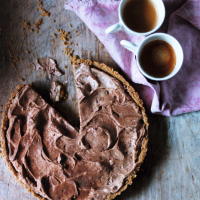 Just before serving, sprinkle the pie with a crumbled Cadbury Flake, or dust with a little Cadbury Bournville Cocoa Powder.